Reduce your communication costs by taking email out of order management. 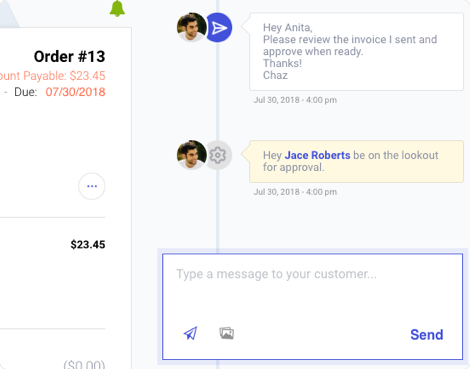 Quickly send & receive messages & proofs, straight from an order. Interact directly with your customers through an easy-to-use interface, without ever having to open an email account. Mention team mates in internal notes to send them a real-time message. No emailing or walking to their desk. 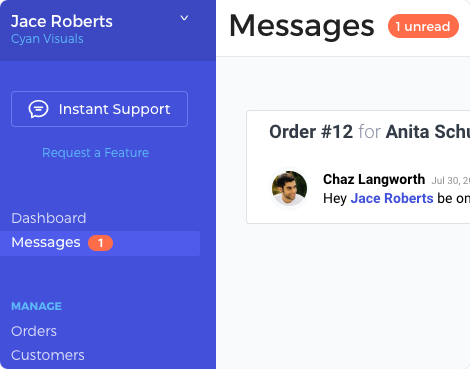 Keep your team on task with distraction-free messaging, all built in to every order. Be more efficient by always knowing who needs, instantly, and without digging. Each time a message comes into Take2, you and your team get real-time notifications on desktop, and mobile (beta). When customers respond to you via email, messages come in as real-time notices, directly on the order. You'll never miss an update. You can easily see all of your messages from one easy-to-understand dashboard. Every message ties directly back to the order, so you never have to waste time digging. Give your customers a better experience by improving your teams response times. Easily send large inline attachments without wasting time by having to switch over to email. 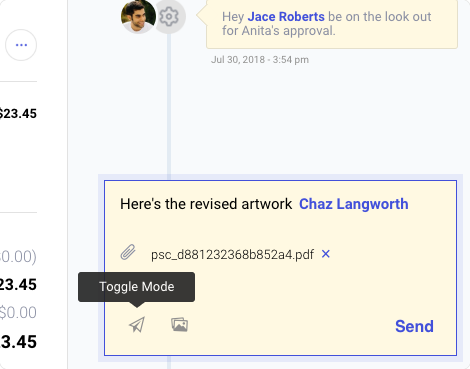 Quickly toggle from sending customer message to internal notes, without creating a new email thread. Control which team members can view & send messages, both internally and externally, so you never have to worry about accidents. Ready to improve your communication?